Charlotte criminal defense lawyer Bill Powers tried his first criminal case in Mecklenburg County State Court in 1992 - the same day he was sworn into the practice by the Honorable William “Bill” Scarborough. Since that time Bill has handled criminal charges as serious as murder and manslaughter, all the way down to simple traffic citations and speeding tickets. It doesn’t matter whether felony vs. misdemeanor, our law firm helps people when they’re in trouble. North Carolina has a somewhat unique way of handling criminal cases. Defense lawyers need to be familiar with how things are handled in both District Court and Superior Court in NC. Many, if not most all criminal cases start in North Carolina District Court. That’s true if they’re felony or misdemeanor. If it turns out to be a felony criminal case, that normally ends up in Superior Court. Except for unusual circumstances, misdemeanor charges in NC have what is called original jurisdiction in District Court. 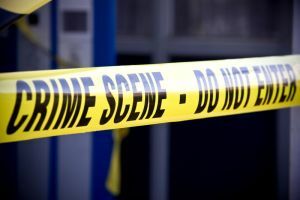 Misdemeanor charges like larceny, assault and battery, DUI-DWI, possession of marijuana and drug paraphernalia - if they are handled in District Court - are heard by a North Carolina District Court Judge during a session of Criminal Court. That means the Judge serves as both judge and jury in criminal cases in NC. All criminal charges in NC must be proven Beyond a Reasonable Doubt. Under a special provision in the NC Constitution, criminal cases heard in District Court may be appealed to Superior Court for a jury trial. Experienced criminal defense attorneys call these “de novo appeals” to Superior Court. 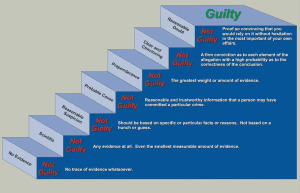 Juries determine whether the accused is guilty or not guilty. Judges make rulings on the law and admissibility of evidence in all criminal charges in NC. - it doesn’t matter whether felony vs. misdemeanor. Many misdemeanors are traffic ticket cases or vehicle violations (for things like driving under the influence, resisting an officer, hit and run, racing, or reckless driving NC). 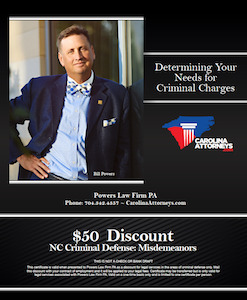 Bill Powers is known statewide in North Carolina for his dedication to DUI defense. He also has been recognized for his work on NC criminal cases by Best Lawyers of America®, which is a publication by U.S. News and World Report® magazine, where he was included in Best Lawyers "Lawyer of the Year" CRIMINAL DEFENSE: GENERAL PRACTICE Charlotte, North Carolina 2017. The criminal defense lawyers and our law office were also included in the 2018 U.S. News – Best Lawyers ® “Best Law Firms” publication. The firm has been named a Charlotte Tier 1 “Best Law Firms” in the area of DUI-DWI Defense. 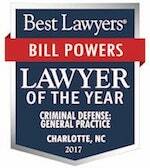 Our Charlotte criminal defense lawyer has been named by Super Lawyers North Carolina Magazine for 12 straight years, which covers from being listed from 2017 to 2018, and was also added in 2018 to the list of the “Top 25 in Charlotte” and “Top 100 in North Carolina” among ALL LAWYERS and ALL PRACTICE AREAS - not just limited to criminal defense lawyers. That means alcohol and drug crimes are the type of criminal case with a high demand for our law firm’s legal services and legal representation. Bill Powers makes it a point to mentor younger criminal defense attorneys by teaching continuing legal education on misdemeanor and felony cases, and other criminal defense law cases in North Carolina. Bill Powers was the 2016 – 2017 President of the North Carolina Advocates for Justice, the largest voluntary organization of North Carolina criminal defense lawyers and plaintiffs’ attorneys in the State. NCAJ is a nonpartisan association of legal professionals dedicated to protecting peoples’ rights through community, education, and advocacy, and offers NC FREE LEGAL HELP. Our criminal defense lawyers have helped clients throughout North Carolina with cases involving drug charges, marijuana possession, selling weed, drug trafficking drug possession, and possession with the intent to sell and deliver. Legal representation is not strictly limited to Charlotte NC for criminal defense. We have and will travel throughout North Carolina for serious felony criminal defense, DUI-DWI defense, and cases like Robbery and Robbery with a Dangerous Weapon. There is a reason we do that. First, it’s easy to remember the telephone number of your criminal defense lawyers. Second, we help people with criminal charges in NC. Our focus is helping you and other clients with criminal charges. We want to help you through this difficult time. We are willing to travel throughout North Carolina for things like serious DUI-DWI charges in NC. Bill Powers and all our criminal defense lawyers offer a FREE lawyer consultation. Call NOW: 704-342-4357. We offer 24-hour lawyers for emergency or pressing legal matters. We do NOT use paralegals or legal assistants to discuss your important legal case. So you should expect to speak with a lawyer when you call. We normally charge a flat rate for criminal defense cases, including DUI charges in NC. Our criminal justice lawyers talk to potential clients for FREE and do not require advance payment of attorney’s fees prior to the initial consultation. Our firm offers legal representation with payment plans for our legal services that will fit most budgets. Once you hire our firm and legal team, we will guide you through the criminal justice process, offering guidance and help. 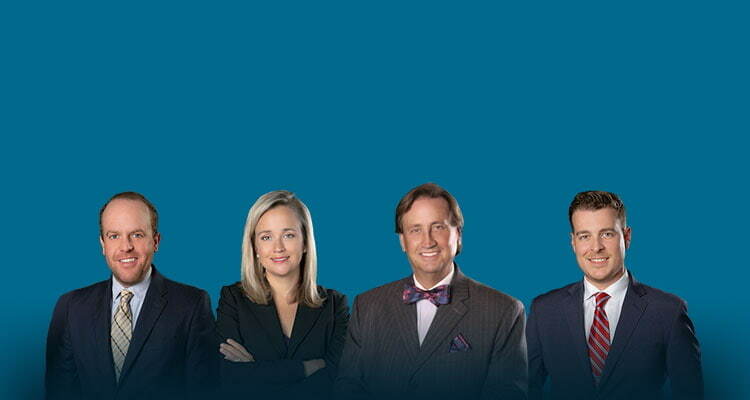 Our Charlotte criminal defense lawyers are ready and able to talk to you. Call now.